Mark Your Space is the well-known and respected source for all types of directory and suite signs in Chicago and its surrounding communities. Of course, building this reputation is not something that happened overnight. In fact, it has taken – and continues to take – stellar craftsmanship and superior customer care to remain a thought leader in this field – and one of the frequently sought after professionals. How do we do it? We do not just provide a service to our customers, but we genuinely care about your needs. This is why each of our directories or suite signs are customized to reflect the unique character of your office or building. The sign represents your company and expands on the tone that you hope to set within your venue. We understand this. We are not one-trick-ponies. When you talk to our knowledgeable professionals, we do not simply suggest an acrylic or PVC marker. Rather, we make suggestions that sometimes require some out-of-the-box thinking. Our suite signs may be made from real wood or from foam that can be treated to look like lumber. We use metal, formed plastic, flat acrylics, stone and high density urethane. In short, if you have a “vibe” that you want to transmit, we have the signage material to make it happen. 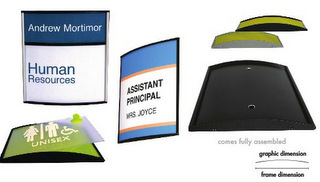 Do you want your directory to be flat and blend into the surrounding wall space? Would you prefer for it to stand out? Would you like the frame to have a three-dimensional effect but for the actual data to be flat? Whatever look or combination of style elements you would like to see on your walls, we can make it happen. By capitalizing on the unique properties of the materials we use as well as on the various ways that these materials can be utilized in the making of the markers, we achieve the right look for your setting. Yet there is another reason why our customers frequently choose us again when they have signage needs: We cut down on the red tape. We are well versed in the restrictions placed upon business signage by Chicago officials. Over the course of the years, we have built good working relationships with officials and know how to file the permit paperwork to include all of the information that these officials need to get your signs permitted quickly. In addition, we also have established a good set of procedures for working with landlords and building management companies. Frequently, these groups oversee the permissible signage selection for your venue and have to sign off on the permits just like the city officials do. Rather than leaving you to deal with these issues, we work directly with our established contacts to quickly get the paperwork done so that the manufacture of your signs can begin. 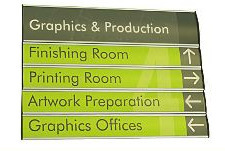 As you can see, there is a real advantage to doing business with an experienced signage company like Mark Your Space. Find out how we can make a difference for your company today!